— Thomas Piketty in Capital in the Twenty-First Century. The key question then is not ‘to decide whether it is justified’ – that is a decision that no one can make – but what can be done to reduce extreme inequality. Rather than treating the symptoms top-down through additional taxes or regulations, we should try to address inequality’s root causes by increasing competition for people in the upper levels of income. We all love competition when it impacts the other person or the other company. But we dislike competition when it impacts us or our own company. This is completely rational: the competition on the other reduces our expenses but the competition on us reduces our revenues. In a completely open meritocracy, competition would increase as income increases and would over time normalize and bring down unusually high incomes. But the economy does not function this way in part because people naturally try to reduce any competition that may be directed against them or their activity. Of course, not all are successful in this effort. Those with little wealth or power, say agricultural laborers forced to compete with unskilled immigrants, have few options to reduce that competition, to increase their own job security or to lower pressure on their own wages. But those at the other end of the income scale who do enjoy some measure of wealth and power can implement practices and enact rules and regulations that restrict or eliminate competition on themselves. This is how cronyism works: it lowers competition and cements the dominant position of the wealthiest in society. And by doing so, it raises the income and wealth of some to new heights and keeps them there for a long time. By contrast, more competition in all economic activity is the antidote to cronyism and is the best way to reduce inequality and to improve efficiency. If we are serious about reducing inequality, we should ensure that we have more competition in the upper echelons of income all the way up to the CEO suite. Compared to ‘capitalism’, the term laissez-faire has less political and ideological baggage and merely refers to an organic way of trading that comes naturally to human beings everywhere seeking to increase their security and comfort. Laissez-faire conditions are more likely to endure when there are fewer practices, taxes and regulations that hamper competition. In scenario A1, a person earns $2,500,000 every year, roughly the amount needed to place him in the top 0.1% of earners in America. This person earns the same amount for thirty years in a row. This assumption is unlikely but it is suitable for our experiment. Every year, he spends half of his after-tax income and invests the other half for an annual net real return of 4% (net of inflation and taxes). This man has a net worth of $24.2 million after 20 years and of $45.6 million after 30 years. (Calculation assumes an effective income tax rate of 35%). Scenario A2 is similar except that the earner invests more aggressively after his net worth clears $20 million. Above that threshold, he is investing his money for an annual net real return of 8%. His net worth after 30 years is $69.9 million. This scenario is typical for the very wealthy because they are offered higher-earning investment opportunities. 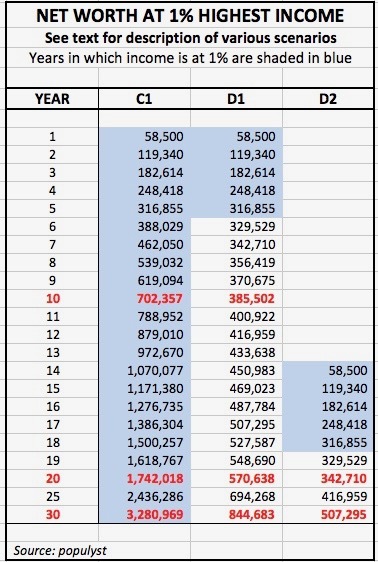 In scenario B1, a person earns $2.5 million per year but only for the first five years. She spends half and saves half. After five years, she earns less money and breaks even on her spending with no additional sums added to her savings. This woman has savings of $7.9 million after 20 years and $11.7 million after 30 years. 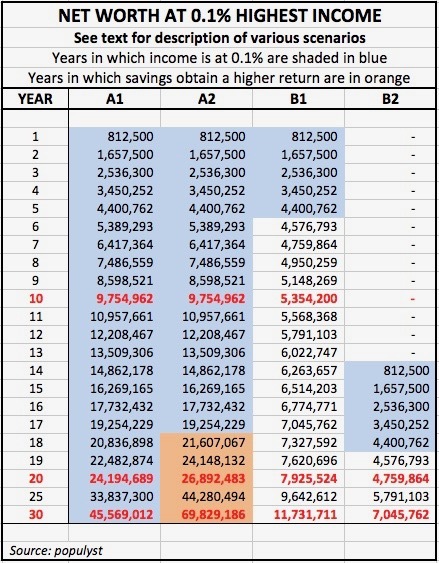 Scenario B2 is similar to B1 except that the five high-earning years are not at the beginning but in years 14 to 18 of the 30-year time frame. This is far more typical than B1 because most people who would ever see this kind of money would likely earn it in mid-career rather than early on. This person has little or no savings for the first thirteen years and has a net worth of $7 million at the end of thirty years, or about 10% of the net worth of the person in scenario A2, the perennial high earner and aggressive investor. The wealth gap that differentiates the person in scenarios A1 and A2 from the person in scenarios B1 and B2 is very large. The most realistic scenarios (A2 and B2) have B persons amassing only 10% of the wealth of A persons after thirty years. And this does not even account for the fact that most people who can maintain themselves in the 0.1% of high earners likely will earn progressively more than $2.5 million per year. Similarly, let’s look quickly at the persons in scenarios C1, D1 and D2. These are similar to A1, B1 and B2 but for earners who just clear the 1% threshold or $450,000 annually in their highest earning years. In C1, this person earns $450,000 for 30 years straight and saves 20% of his after-tax income. His net worth at year 30 is $3.3 million. In D1, the person earns $450,000 for only five years at the beginning of the 30 years; and in D2, in years 14 to 18. These people have net savings of $845,000 and $507,000 after 30 years, or roughly 26% and 15% of C1’s net savings. So now the main question is what makes a person able to maintain themselves at a $2.5 million annual income for 20 or 30 years vs. another person who sees that kind of money for only five years? The answer is clear: in the first case, a high degree of sustainable expertise and/or a lack of competition. And in the second case, obsolescence of one’s expertise after a few years and/or an increase in competition. We can agree that if a person is able to sustain their expertise at peak level for thirty years, then they deserve to get the corresponding income. These people tend to be extremely rare, and can be found for example in medicine, music or the arts. The problem is with the other group, those who maintain themselves in the top bracket not through expertise but by reducing competition around them. The people in scenarios B1, B2 and D1, D2 would be typical of nearly all high earners if there was a sufficient amount of competition at the highest levels of the income scale. It would then be difficult to impossible for them to stay at the top for more than say five to ten years before competitors downsize their earnings. What is clear is that people who attain the higher brackets, say the 0.1% or the 0.01% of earners, also attain a level of power that allows them to limit competition through lobbying or other mechanisms. In this regard, the 2008 crisis did not lead to the most desirable outcome. Not only did some of the offending banks and executives remain in place more or less intact, but there was also added regulation that cemented their market positions and allowed them to operate with much less competition in the ensuing decade. Alas, both political parties are now engaged full time in reducing competition. Some of their efforts may be justified by other concerns (social, environmental etc.) but their net effects are undeniably anti-competition. On the right, the new curbs on immigration and open trade, regardless of their motivation, will certainly limit competition and may raise inflation. In addition, the continuing permissive attitude towards consolidation of nearly all industries also reduces competition. On the left, the addition of more regulations and environmental restrictions and the threat of high taxes all deter new entrants, raise the stakes for weaker players and destroy competition. The best way to reduce inequality is to increase the amount of competition in all economic activity because competition reduces unusually high incomes and investment returns. This is what we have to do if we are serious because nothing else will work. This article first appeared on Populyst.net. Sami Karam is the founder and editor of populyst.net and the creator of the populyst index™. populyst is about innovation, demography and society. Before populyst, he was the founder and manager of the Seven Global funds and a fund manager at leading asset managers in Boston and New York. In addition to a finance MBA from the Wharton School, he holds a Master’s in Civil Engineering from Cornell and a Bachelor of Architecture from UT Austin.